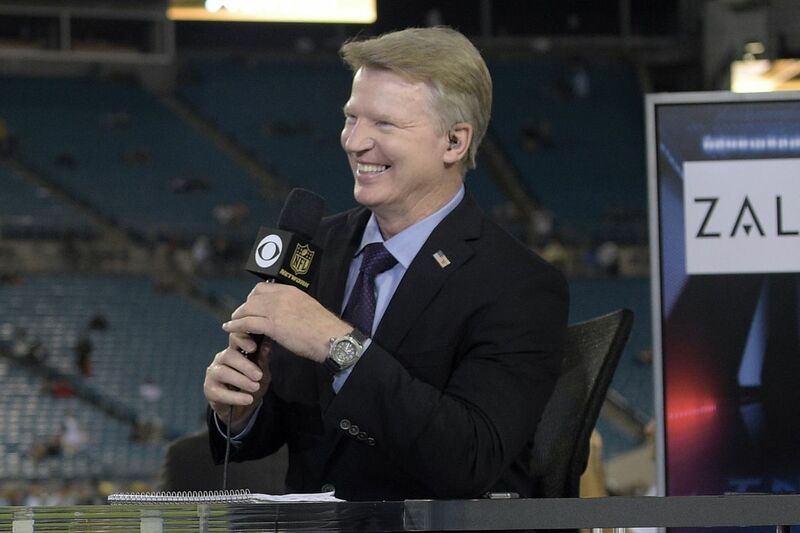 Phil Simms is enjoying his new role as a member of CBS’ NFL pregame show, but admits offering Tony Romo some choice words after the retired Cowboys quarterback replaced him in the booth. 2017 was a year for change for Phil Simms. In April, the longtime NFL analyst for CBS Sports abruptly lost his job in the booth to retired Cowboys quarterback Tony Romo. Simms has spent the football season as part of The NFL Today, the network's pregame show, alongside Boomer Esiason, Bill Cowher, Nate Burleson and host James Brown. Change isn't easy. And the former Giants quarterback loved his role calling games every Sunday for CBS, which allowed him to stay connected to players, coaches and the game. But by most accounts, the move to the studio for the 62-year-old broadcaster has been positive, freeing him up to follow more teams and players while shedding the burden of traveling across the country every week. "I don't have to devote most of my time on just the game I'm going to do," Simms said. "So that part's been really cool." A downside is a new routine that involves leaving the house on Sundays around 7 a.m. and not returning until after 9 p.m. The worst day of Simms' week is Friday, which features conference calls, interviews with players and coaches, and condensing his opinions on the hours of game film he's watched into 30- to 40-second sound bites that fit in the structure of Sunday's show. "I wake up in cold sweats on Friday," Simms joked. "I could talk for 10 minutes about each game, but you end up whittling down to a couple thoughts on each side of the ball you think are really cool or different." Simms hasn't exactly gotten the headlines or attention that his replacement, Romo, has earned for his work in the booth this season. But CBS Sports chairman Sean McManus said moving Simms into the studio has added the chemistry and humor he and Esiason share on Showtime's Inside the NFL to the network's flagship pregame show. "He's remarkably unselfish, and he's just as comfortable setting someone up for a good comment as he is giving a good comment himself," McManus said. "He's also got a very good sibling rivalry with Boomer, which we sometimes actually have to rein in because it can get out of hand sometimes." Often, the humor comes at the expense of Simms, as it did in September when Esiason told Romo during a remote appearance on The NFL Today that he had been "awesome" in his NFL debut. "That's for you, Phil," Esiason jabbed as he looked straight at Simms. Simms was just one of many moving parts during a year of big changes at CBS Sports. The network also hired NFL Network analyst Nate Burleson for its pregame show, adding the perspective of a recently retired NFL player. Former tight end Tony Gonzalez left his role as an analyst on The NFL Today after three years to join Fox Sports. On the college football side, beloved play-by-play announcer Verne Lundquist was replaced with Brad Nessler as the network's leading voice for SEC football. But it was replacing Simms, who had called games for CBS for nearly 20 years, with rookie announcer Romo that has been the most consequential for the network. There was concern Romo would be in over his head. But McManus has been pleasantly surprised by reviews of Romo's work. "In all my years of television, I haven't seen anyone get this amount of immediate positive reaction, especially on social media, which is often so vitriolic," McManus said. "It doesn't happen in the world of sports television like this." After Romo was hired in April, the former quarterback spoke to seasoned broadcasters such as Nantz, Danielson and NBC's Cris Collinsworth, and put in countless hours going over broadcasts with longtime lead producer Jim Rikhoff. Ahead of the preseason, Romo practiced calling games for hours alongside Nantz and Cowboys radio voice Brad Sham, dubbed a "broadcasting boot camp" by Dallas Morning News writer Barry Horn. "We had a pretty good idea halfway through the summer this was going to work," McManus said. "I thought it was going to take longer to really get the chemistry going, but it's happened much more quickly than I thought it would." “Hey, Tony. How you doing? How’s that seat feel?” Phil Simms pokes fun at Tony Romo ahead of calling his first NFL game earlier this season. McManus and Simms had discussed a move to the studio for many years, but Simms acknowledged that finding out he was being replaced by Romo was tough at first. He told Sports Illustrated's Richard Deitsch that the move initially hurt his pride. Simms wouldn't reveal exactly what he told Romo during a phone call a week or so after the news was announced. But he said he used some choice language to taunt the former Cowboys quarterback for stealing his job. "We laughed and talked about the job. Hey, it's just the way it is," Simms said. "I took [former NBC announcer] Bob Trumpy's job one day, and this time it was time for me to move on." Simms' relationship with Romo goes all the way back to Romo's days as the backup quarterback under then-Cowboys head coach Bill Parcells, who also coached Simms during his playing days with the Giants. Before his move to the studio, Simms called two Cowboys games a year for CBS and developed a good relationship with Romo over the years. He was also one of the many broadcasters Romo turned to for advice on how to be a good NFL analyst. "I'm not saying we're close, but we have a good relationship. If we saw each other now, there's not going to be any animosity between us," Simms said. "I don't know why people think that." Even after the change 2017 brought, if it were up to Simms, there's another big move he'd like to take on: becoming a sports radio host, something he's fallen in love with after guest-hosting alongside Esiason on WFAN in New York City this season. "It's fantastic. I love it, I absolutely love it," Simms said. "I get to really talk, and we get into conversations I'd never get to anywhere else in public. "One day, I'm going to host a show. It's a must. I will absolutely do talk radio."